Half term things to do in Hastings - part two! Next week is half term. Stuck for something to do to keep the kids amused? Here’s the second of our two part blog about interesting Hastings places, where parents can take their children to keep them entertained during the October half term break! Based in the old town visitors can go through an undersea safari through the oceans of the worlds. The aquarium takes visitors through 'underwater gardens' of the Mediterranean and the stunning beauty of tropical waters which is home to everything from seahorses and puffer fish to living corals and native sharks. The Aquarium also has a spectacular coral reef housed within a gigantic ocean display with an underwater walk-through tunnel. Take the kids to the Shipwreck Museum where they can explore the wrecks of the Dutch East Indiaman Amsterdam and the worship Anne which is the best known surviving vessel from Samuel Pepys' Restoration Navy. Children will learn the story when the Amsterdam was wrecked on the Hastings shore and was quickly swallowed up by the beach in 1749. In Hastings there are two funicular railways, the West Hill Railway and the East Hill Lift. The West Hill Railway is the steepest funicular railway in the UK. Its lower station is based in George Street which is full of continental style cafes, bookshops and art-shops. From the top of the West Hill visitors are able to see some remarkable views such as Beachy Head in the west and out across the Channel. It was on the West Hill that Hastings resident John Logie Baird the inventor of television made his first radar experiments. 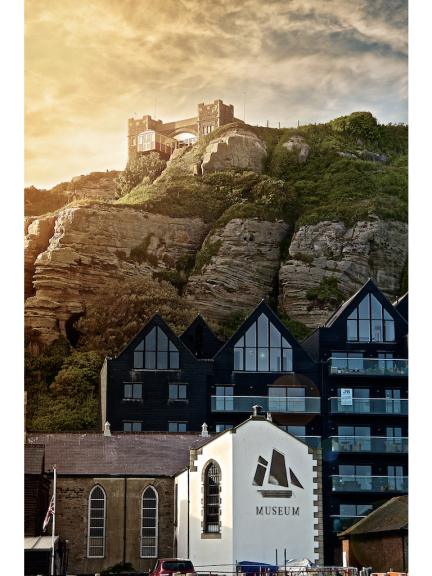 The East Cliff Railway provides access to Hastings country parks which allows visitors the opportunity to overlook the old town, Rock a Nore and the Stade, which boasts one of the largest beach launched fishing fleets in Europe. The East Hill Railway was cut into the face of the East Hill Cliff unlike the Railway on the West Hill which is hidden in a tunnel that is dug through the cliff. So if you've got kids who are crazy about trains then you might want to go on both! If you are looking for your kids to have fun outdoors then take then down to Battlezone Lazer Hastings where they can come and play some realistic combat games, hiding in bushes to snipe your enemies and diving into the dirt when smoke bombs goes off. Battlezone Laser Hastings is for children over the age of 6 but is situated on the same site of Clambers indoor play area for the younger kids. Battlezone Laser Hastings also provides high tech equipment in order to help you win the battle! With the option of hiring combat styled overalls for an additional charge so that clothes don’t get grubby! Or you could be just looking to gain advantage on the other team by being in camouflage! If you fancy taking the family out for a walk, then go on a walk with ‘Curious About Hastings’ where you will be given an fascinating and entertaining glimpse of what makes Hastings historic and the charming seaside town it is. ‘Curious About Hastings’ provides two walks which you could do separately or do them both. The first walk is the Old Town Circular which starts at the former Town Hall where you will be given an insight into its 'heady bohemian atmosphere'. On the walk you will pass the quaint buildings and quirky shops before walking down to the town's shingle beach. The second walk is from the Old Town to the Castle where you will walk along the sea front and through the Old Town's busy and bustling streets before walking up the steps of the East Hill to Hastings' delightful, ancient castle.